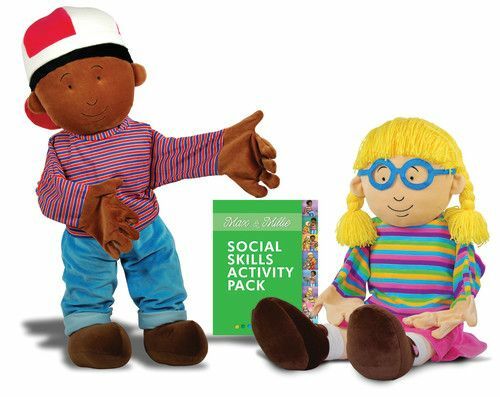 The Social Skills Puppet Set featuring Max and Millie is here to help enhance the social lessons in the classroom or therapy setting. Eight categories of behavior are covered and include sharing experiences, being nice, playing and working together, performing a task, presenting yourself, making choices, standing up for yourself, and dealing with conflict. 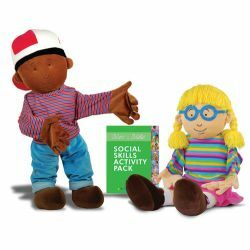 Each category includes a lesson featuring a story targeting the behavior, puppet dialogue to engage the children, illustrations for coloring, and different exercises to further discussion. Twelve full color cards are also included to aid children in exploring the feelings and emotions associated with different social situations. CONTENTS: 1 Max hand puppet. 1 Millie hand puppet. 71 page book.